My mother had a unique way of controlling the Japanese beetle population on her roses. She’d send whichever grandchild happened to be around out into the yard with a jar of ammonia. The going rate was a nickel per bug caught and drowned in the ammonia. Most gardeners are familiar with the Japanese beetle. These colorful metallic green beetles have voracious appetites and make lunch out of some of our prettiest flowers, like roses, often devouring rosebuds before they open. A close cousin, the Asiatic beetle, is a less pretty bug (it is tan with darker spots) but also a voracious pest. Another relative lives in my garden and comes out to eat at night. It took me years to figure out who was eating my plants, since I never saw the culprits. I finally had to go out with a flashlight to see the mahogany brown beetles munching away. These guys are FAST, too, and hard to catch. Luckily, I do not have a big problem with beetles. I don’t use pesticides, but I grow plants that attract beneficial insects. I keep my garden watered and healthy. Stressed plants attract bugs like a magnet. And I hand pick any that I see. I also do not grow a lot of roses or Shasta daisies, which are delicious and attract beetles. If you grow asiatic or oriental lilies, you may have had some experience with a somewhat newcomer to our region, the lily leaf beetle. 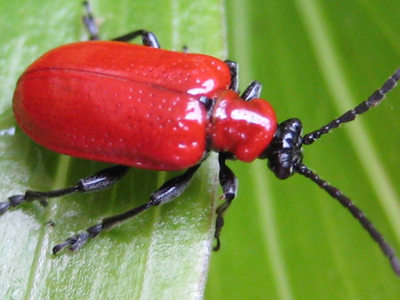 This bright red bug has a voracious appetite for lilies and can strip a plant of its foliage in no time. According to the University of Rhode Island Plant Science Department fact sheet, the lily leaf beetle, native to Europe, was discovered near Montreal, Canada in 1945. Its damage was limited to the Montreal area for decades, but recently it has spread to the south and west. The beetle was first officially sighted in Cambridge, Massachusetts in the summer of 1992. The beetles are strong fliers and excellent hiders. They have spread as much as 150 miles from Boston, in many cases with the assistance of gardeners. At present the infested area in the USA reaches into all of the New England states, including southern Connecticut and northern Vermont. Not all areas are yet infested and gardeners who are transplanting bulbs and other garden plants should be careful not to move these beetles to an uninfested area. 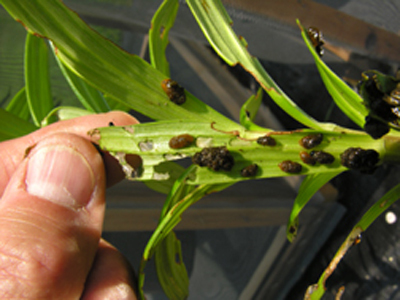 Lily leaf beetles will taste or feed lightly on many plants including Lilium spp., Fritillaria spp., Polygonatum spp. (Solomon’s seal), Solanum dulcamara (bittersweet nightshade), S. tuberosum (potato), Smilax spp., Nicotiana spp. and other plants. However, they will only lay eggs and develop on Liliuim species (Turk’s cap lilies, tiger lilies, Easter lilies, Asiatic and Oriental lilies), and species of Fritillaria. The lily leaf beetle adult is a striking insect with a bright scarlet body and black legs, head, antennae, and undersurface. The adults are 6 to 9 mm (1/4 to 3/8 inch) long, and they will squeak if they are squeezed gently--a defense mechanism to deter predators. Adults and older larvae feed on leaves, stems, buds, and flowers of the host plant. Adults lay their eggs on the underside of leaves in an irregular line. The reddish/orange eggs take from 7-10 days to hatch under normal conditions. Females lay up to 450 eggs, sometimes over two growing seasons. Larvae resemble slugs with swollen orange, brown, yellowish or even greenish bodies and black heads. Larvae tend to cause more damage than adults. Larvae are distinctive and repulsive in that they secrete and carry their excrement on their backs. Younger larvae feed for 16-24 days, primarily on the underside of leaves. Larvae enter the soil to pupate; pupae are florescent orange. New adults emerge in 16-22 days and feed until fall. They do not mate or lay eggs until they emerge the following spring in late March through June. Lily leaf beetles overwinter in the soil or plant debris in the garden or woods, sometimes a distance away from the host plants. Adults prefer environments that are shaded, protected, cool, and moist. Hand-picking should be the first level of control if possible. Constant vigilance and quick removal and disposal of beetles, eggs and larvae can control an infestation on a small number of plants. Make sure the critters are actually dead! If you squash them, don’t leave the squashee in the garden. Some gardeners drop them into a can of water with vegetable oil on the top. If you suspect the beetles may be lurking around your lilies but you don’t see any, carefully dig in the top half inch of the soil - no deeper! They hide just under the surface, so be ready to get them when they pop out. The adults are easily spooked when you try to pick them by hand, and if you “miss” them, they tend to drop to the ground where THEY LAND UPSIDE DOWN, and since their tummies are black, they effectively vanish. The suggestion was to place a light-colored cloth under the plant before you hand-pick in order to be able to see the nasty little things if they fall. If your garden is overrun with the beetles and hand picking has not gotten rid of the beetles, the University of R.I. fact sheet suggests treating flowers with neem, an insecticide based upon extracts from the neem tree. Neem can be purchased at garden centers under the trade names Turplcx, Azatin EC, Margosan-0, Align and BioNeem. Neem kills larvae and repels adults. Neem is most effective on first instar larvae; it must be applied every five to seven days after egg hatch. Click here to visit the UMass Extension service's website for their "Fact Sheet" on Lily Leaf Beetles.